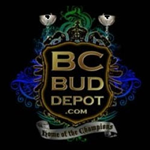 BC Bud Depot - 707 Headband. Free US delivery. 707 Headband is an OG Kush indica/sativa hybrid marijuana strain with very high potency levels. It is one of the most sought after strains in California due to its special qualities; even the experienced connoisseur smoker will get the "headband" effect around the head after smoking/vaping this exceptional weed. 707 Headband was bred by crossing Sour Diesel with OG Kush and then back-crossing the result with OG Kush. Special plants such as this often require experience and great diligence on the part of the grower and 707 Headband can be somewhat tricky for novice growers, however, perseverance will be rewarded with fantastic results. An indoor strain that can grow between 150 - 180cm. tall it produces moderate yields of superb buds in around 8 - 9 weeks of flowering. Sour and rich Kush flavours are intense as is the high which is also deeply relaxing and long-lasting. An important facet of the 707 Headband is that it is a strain that is very difficult to develop any sort of tolerance to; this fact coupled with its high 22.8% THC content, makes it a very useful medical marijuana strain which is recommended for depression, pain relief, insomnia, lack of appetite and stress.